It was a mural, one of many painted in curving arches high above our heads. 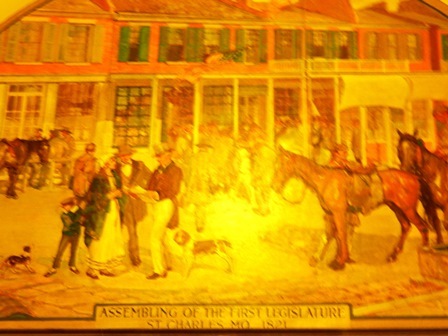 “Assembling of the First Legislature At St Charles, 1821” was the one Jim wanted us to see. Interesting. 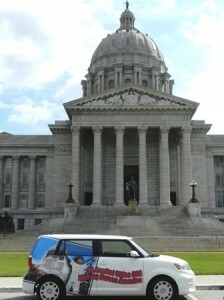 “They thought they had a full building to meet in,” Jim explained, “but they only had the top floor to use.” The first two territorial capitals were in St Louis; St Charles was designated temporary state capital in 1821; Jefferson City was the final choice in 1826, by legislative decree. 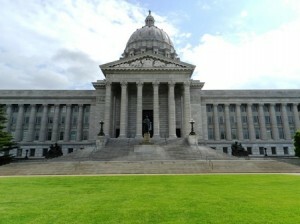 The first capitol building in Jefferson City was made of brick, two stories tall, and measured 40 x 60 feet. It burned in 1837, but a new building had already been approved for construction; it was completed in 1840 and was much larger, with 50,000 square feet. Alas, it too was destroyed by fire in 1911, when a bolt of lightning struck the dome; Senator William Warner said “I have no tears to shed over the fact that the building has been destroyed as it was totally inadequate and not in keeping with the requirements of our great state.” So, bigger still. Really big. The current capitol is five stories high, 437 feet long, 300 feet wide in the center and 200 feet wide in the wings. It includes 500,000 square feet of floor space and covers nearly three acres. It houses two legislative bodies, offices for the governor, lieutenant governor, secretary of state, state treasurer, state auditor, and some administrative agencies. The first floor houses the State Museum. Spacious. It stands upon 285 concrete piers which extend to solid rock at depths of 50 feet. The exterior is Missouri limestone marble, as are the floors of all the corridors, the rotunda, and the treads of the stairways. There are 134 columns in the building. 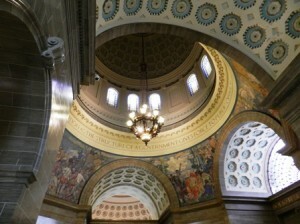 It has a 30-foot wide grand stairway that extends from the front portico to the third floor; the stairway is more than 65 feet wide from one wall to the other. At the entrance two mammoth bronze doors are 13 x 15 feet. Each. 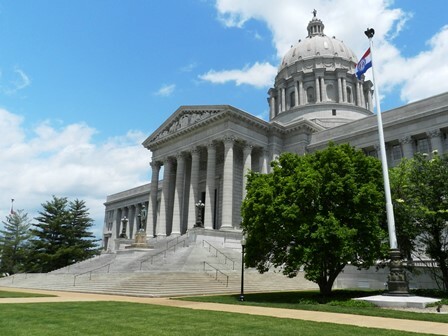 The dome rises 238 feet above ground level and is topped by a bronze statue of Ceres, Roman goddess of agriculture; it is the first view of Jefferson City as you come in from the north. 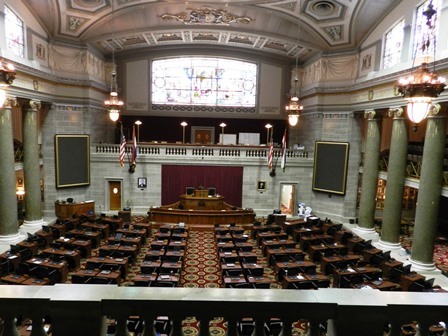 The capitol is Jefferson City’s leading tourist attraction and a destination for school groups who arrive by busloads, particularly during General Assembly sessions, when students fill the galleries to watch the Senate and House of Representatives in action. Impressive. Jim launched into the budget story next. 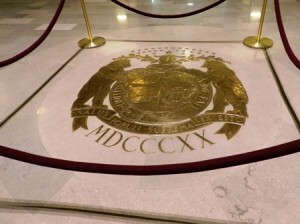 “The original budget called for a building to be constructed for $3 million, with an additional $500,000 allocated for site and furnishings,” he explained, “ and this was approved in general election by a three-to-one margin.” Unbelievably however, the state miscalculated on revenue projections, and ended up collecting $4,215,000. Astounding. These additional funds were used for the sculptures and art that fill the building to the brim. 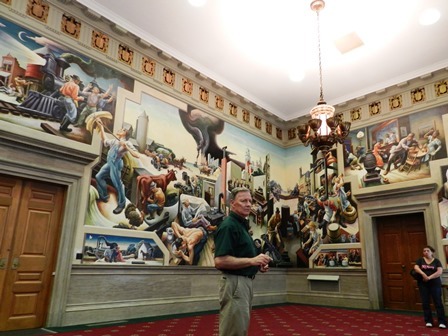 Artwork throughout the building dramatically depicts scenes of Missouri’s history, countryside and people. The paintings of Frank Brangwyn on the eye, panels and pendentive of the dome are clearly visible from the ground floor, and the upper balconies. The grand staircase is flanked by large bronze statues of Meriwether Lewis and William Clark, and the third-floor rotunda is the site of the Hall of Famous Missourians, where a group of bronze busts honor Missourians for their achievements and contributions to the state. Jim stopped before the bust of Emmett Kelly and invited me to take a flash photo for a surprise; Emmett’s clown nose turned red for an instant under the glare. Amazing. 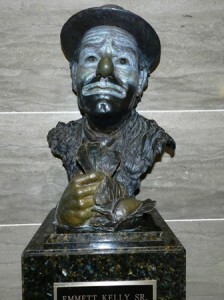 There are 42 busts in the Hall at present, from Samuel Clemens in 1982 to Rush Limbaugh in 2012; we wandered past Harry Truman and Omar Bradley, Walt Disney and J C Penney, Betty Grable and Ginger Rogers, Bob Barker and Dale Carnegie, Edwin Hubble and Stan Musial, Laura Ingalls Wilder and General John J Pershing. Exceptional. Jim pointed out the bronze chandelier hanging from the dome’s eye in the rotunda, 171 feet above our heads.” It weighs 9,000 pounds”, he explained, “and was created in 1918 at a cost of $5,000.” In November 2006, the now-famous “chandelier incident” occurred. The chandelier was lowered within five feet of the marble floor for maintenance; but the crew did not complete their work the first day and left it hanging overnight. When they returned in the morning, it had fallen those last five feet and was damaged both by the impact and by the ornamental chains that fell onto it. Cost of repairs: $500,000. Breathtaking. 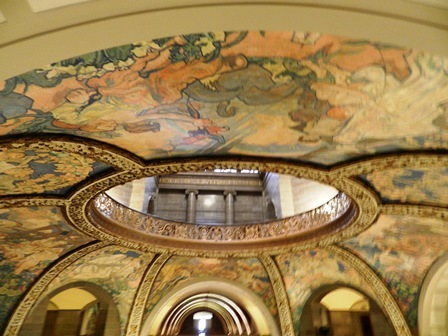 Probably the most famous artworks in the capitol are the murals by artist Thomas Hart Benton in the House Lounge. As Jim led us in we promptly took a seat and listened as he explained each segment of the three-walled painting entitled A Social History of the State of Missouri, a subject so vast I’m discussing it in a separate post. Monumental. The Chambers were closed to the tour today, but I prevailed upon Jim to please let me peep in the door of the House for a few quick photos. He grabbed a key and back upstairs we went, into the gallery, where I saw the beautiful stained glass, the stately columns, and the well-ordered desks of the 163 legislators (4th largest state legislative body in the country). “You may not want to get a picture of that,” said Jim, pointing to a tiny gnome stuck high on a ledge in a corner of the balcony. “Somebody always pulls a prank on the last day of session.” Hilarious. I thanked Jim for a wonderful tour, purchased some postcards from the giftshop, and headed for my car, with only one word left to say. Superlative.